The annual Nectar of Song tour is underway, kicking off with a dynamic evening of Kimberly’s soundscapes and songs. Baraka Moon joins Kimberly delivering their soulful, spiritually charged dance & trance. 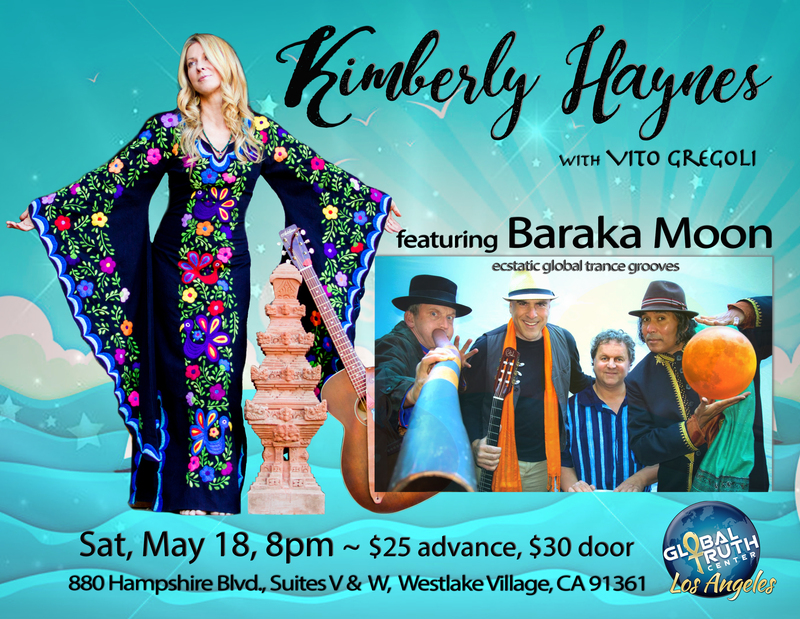 Singer-Songwriter, KIMBERLY HAYNES, transcends genre as she expresses her musical art in a harmonious synthesis of world, pop, and folk. The spectrum of her eclectic vocal performances evokes both the tenderness of a mother’s touch and the ancient feminine power of a tribal priestess. Breaking new ground stylistically, she will introduce songs for her 2019 release. David Vito Gregoli, producer/multi-instrumentalist, featured with Kimberly on guitar and musical direction. BARAKA MOON mission is a positive musical message of peace for the whole world! Uniting influences from mystical Sufi trance songs, Indian ragas, African beats & the Australian Aboriginal didgeridoo. Baraka Moon is based in the San Francisco Bay Area. An epic combination of musical styles and transcendent grooves. Check your email for a link to download "In the Garden"